After the death of his beloved daughter Haruzeh at the Running of the Dunerippers, the Magnifico Z'za retired to his house in Sentinel and never spoke again, spending his last days playing endless games of hammergammon with his trained monkey, Lizard. The House of the Silent Magnifico is a medium player house in Sentinel. It has no exterior, the most expensive house without one, and the interior consists of a single huge room that has an interior balcony surrounding the entrance. A secondary exit on the upper floor leads to a stairway offering roof access, though the roof is not considered part of the house and cannot be decorated. 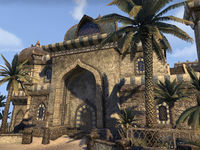 The house can be purchased for 00320000320,000  after completing the main quest in the Alik'r Desert and earning the Consecrated Ground achievement. Or you can purchase it for 041004,100 (051005,100 furnished) without the achievement. 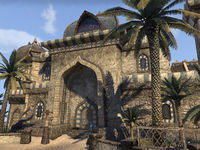 This house replaced Renazh's House in Update 12. The load text is a reference to Neeneban in the Sentinel marketplace, who has a trained Lizard named "Monkey".